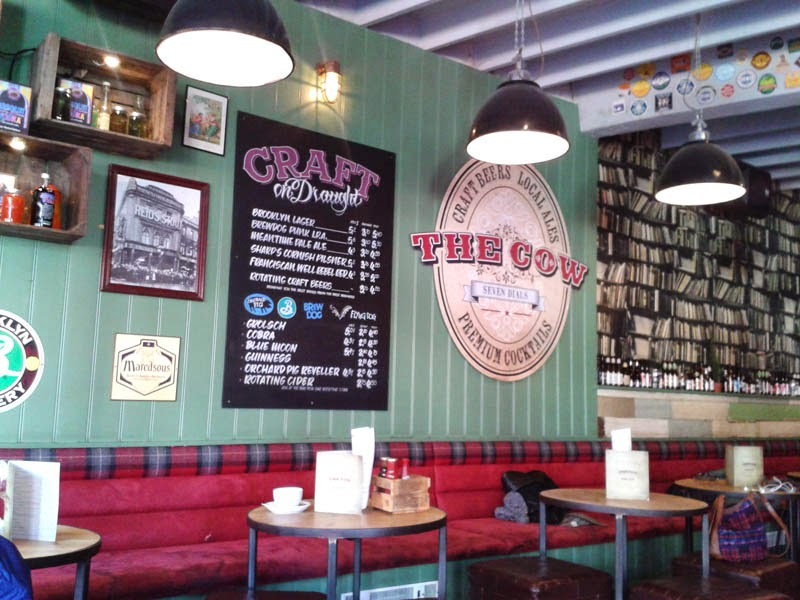 The Cow can be found in the heart of Seven Dials, where the very popular Tin Drum used to be. I have been hearing some very good feedback about the food, including my boss about the Sunday roast and he is one hard man to please with dining! The interior is large, pleasant and attracts quite a variety of diner. There is plenty of buggy space for parents and there were also a few workmen, single diners and workers on laptops in when I visited at lunchtime. I think they have tried to go for a rustic, eclectic look which at some points looks like the Wild West section at Disneyland - all cow print and Western fonts, but overall it just about works. Being owned by the local Indigo pub group, there is always that corporate brand touch that comes with chain ownership I suppose. 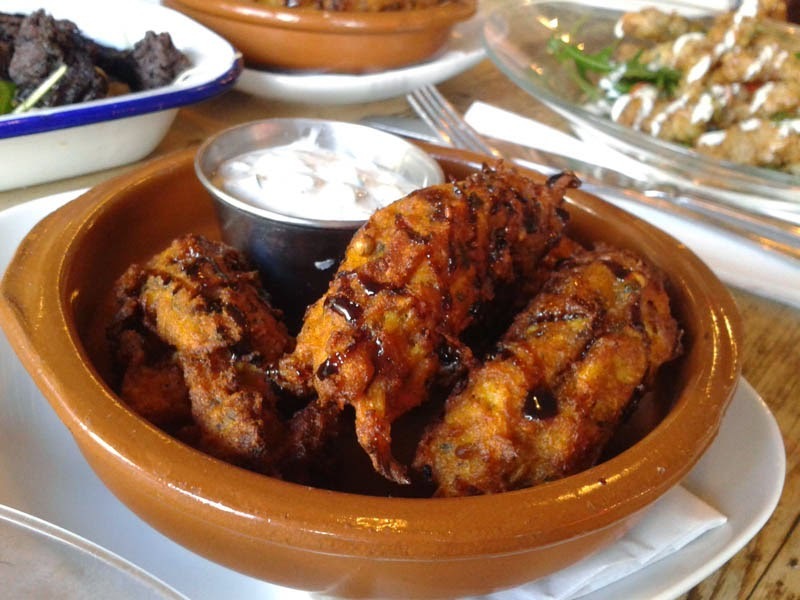 The menu is quite varied with bar snacks and cakes for the minor munchies plus small bites, sandwiches, burgers, sharing plates and a few mains. The deals are also reasonable and the lunchtime 3 small plates for £10 seemed pretty good. Junior Foodie was with me and a variety of food is damage limitation on potential rejection of a single dish. (All parents of toddlers nodding right now.) I also ordered a plate of fish goujons which on reflection was a bit crazy as the three plates were a feast in themselves. There is a kid's menu available, but to be honest, these days my three year old is more at home sharing my food or with small plates off main menus. My favourie dish was probably the lightly spiced cauliflower pakoras. There was plenty going on in there with fresh herbs and were well seasoned. Calimari wern't too bad. 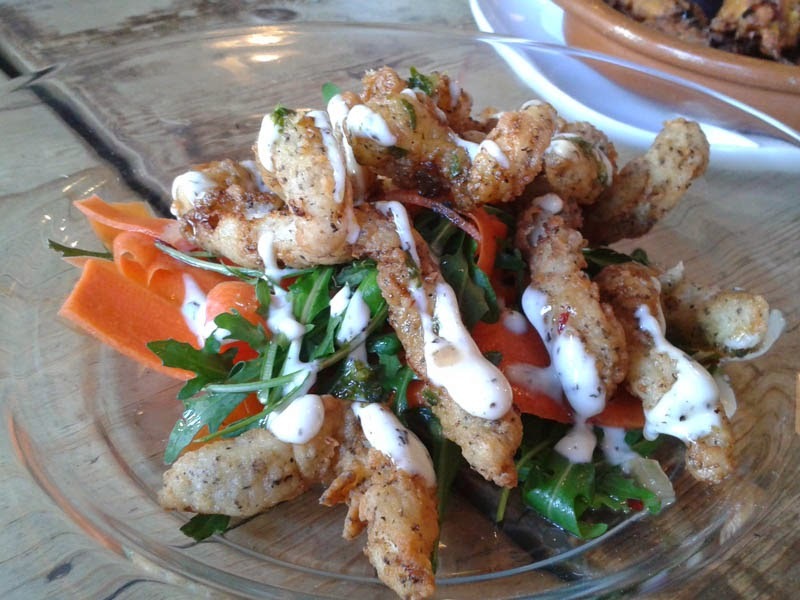 The herb batter was good and carrot ribbon and rocket salad fresh and crunchy. I wouldn't expect the best quality calimari in a pub and this met my assumtions by being on the chewy side. Still, not the worst I've ever had and I've paid far more in the past in fish restaurants for a plate of essentlially tyre trimmings. As the beef noodle salad went down so well, I didn't even have a chance to get a snap before kiddo had half devoured it. The little guy is a noodle monster. The Asian dressing on the rice noodles was fresh and vibrant with crunchy raw cabbage. The thin beef strips were very interesting, cooked to almost a beef jerky driness (I don't mean that to be a bad thing) and were very savoury and crunchy. 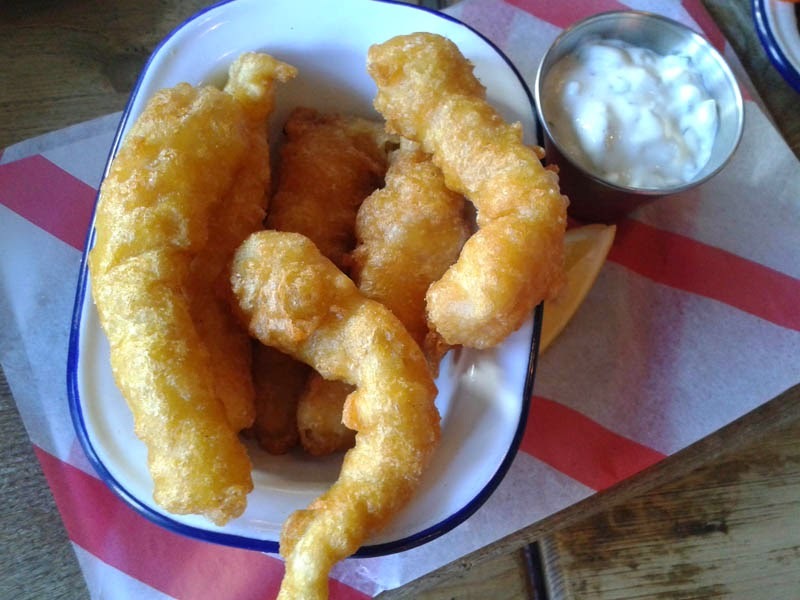 Sometimes fish gougons are just reformed, gloopy fish pulp but I was happy to find fat white fish strips that flaked beautifully, held together by the crisp batter. These were only about £5 or £6 so not bad at all. The only niggle I had really was the generic pots of dip that seemed to accompany every dish which could have had a bit more thought put into. But I was quite impressed with the food I tried and will definitely return for more of the menu (although pretty difficult to order burgers with the excellent Coggings and Co next door). Don't go expecting fireworks or anything particularly inventive with the food, but as modern pub grub goes, the Cow does it very well. The staff were also very accommodating to children with kids cutlery etc., I guess being in the popular family area of Seven Dials they must be used to little diners. As the space was so large, you also don't feel like you are in the way or disturbing other people too much, which makes for a more relaxing experience for parents. This pub also champions craft beer with a choice of "craft on draught" and bottled beers from the UK, USA and further afield. I can imagine that The Cow feels very different come nighttime with a bustling atmosphere and I like places like this that nail that round the clock use from breakfast to boozing. Every neighbourhood should have one.